We all know sun exposure can cause cancer. 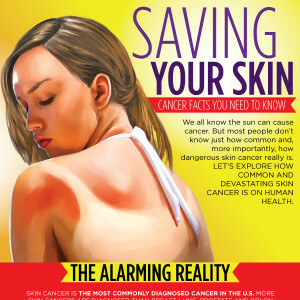 But most people don’t know just how common and, more importantly, how dangerous skin cancer really is. Let’s explore how common and devastating skin cancer is on human health. Skin cancer is the most commonly diagnosed cancer in the U.S. More skin cancers are diagnosed than breast, lung, prostate and colon cancers combined. Melanoma starts in the pigment cells, or melanocytes, in the skin. It can occur on any skin surface, but occurs most commonly on the head or neck in men and on the lower legs and back in women. 76,100 new cases of invasive melanoma will be diagnosed in 2014. The basal layer of skin is the deepest, bottom layer of a person’s epidermis. Basal cell cancer usually occurs in areas that have been in the sun, most commonly on the face. Basal cell is the most common form of skin cancer among light-skinned people. 2.8 million people are diagnosed annually with basal cell skin cancer. Squamous cell cancer generally spreads to other, deeper parts of the body and is considered a fairly dangerous form of skin cancer. In dark-skinned people, it is the most common type and usually occurs in the legs or feet. Incidences of squamous cell skin cancer have increased 200% over the past 30 years. Avoiding the sun altogether isn’t good for you; the sun gives us natural vitamin D and can boost endorphins and dopamine levels. But being smarter about sun exposure could save your life. 1. The sun’s rays are the strongest between 10 a.m. and 4 p.m. Staying in the shade during this time is probably your healthiest option. 2. Try not to burn. Getting five or more sunburns in your life doubles your risk of melanoma. If your skin starts to redden, itch, hurt or blister, seek shelter. 3. Don’t use tanning booths. Just don’t do it. Many tanning salons use lights that emit 12 times the UV radiation of the sun. 4. Use SPF 15 or higher every day. Buying a moisturizer with an SPF of 15 isn’t hard these days. 5. Quickly check for any changes in your skin before hopping into the shower or when changing clothes. If you notice a new mole or dark spot, you’d better get it checked.